Childcare advice from a working mum who loves it. "The unexpected joys I've discovered since my child started childcare." Oh, to be a child again. The new experiences, easy friendships and hours of play – not to mention having a someone who will cook delicious meals and clean up after you (uh, that’s me). As I watch my two children grow up, I love to see them experience the joys in life, whether big or small. And I am grateful that they can experience many of these happy times at their local childcare centre, with the support of their wonderful educators. These are the unexpected joys of childcare, as discovered by my children (Emmy, four and Will, one) and me. I am always looking for ideas for children’s activities, as I spend the majority of my time with my little ones. A scroll through Pinterest is intimidating (sorry, I am not going to sculpt a Minion from a carrot), so thank goodness I can gather lots of down-to-earth inspiration from my children’s childcare centre. Whether it’s watching them learn about turn-taking and exercise from a game of ‘duck, duck, goose’ at pick-up time, or the not-so-subtle requests from my eldest (“Mummy, why don’t we go on walks to the library, like we did on my preschool excursion?”), my children’s childcare centre has provided a wealth of ideas. Learning through play is hugely important to me. It’s why I let my children dip their hands into the flour as we make biscuit dough. It’s why I’m happy for them to run, spinning around and screaming “CRAB!” when they find one on the beach. I want them to be lifelong learners, and not think that learning is finished once a book is closed or the bell rings. It’s reassuring to know that KU Children’s Services, one of Australia’s largest not-for-profit providers of early childhood education and care, emphasise play-based learning at their many centres throughout Australia. Learning through play is what being a child is all about. Play-based learning allows children to make sense of their world independently in natural and organic ways. Image via Getty. My children’s educators really get Emmy and Will. “Emmy really loves art and craft. She’ll stay for ages at the craft table, finishing her artwork, even when the other children have left,” said one educator. “Will laughs, claps and shouts ‘Yay!’ when we sing songs. He also dances!” said another. The fact that Emmy and Will’s teachers have picked up on their individual interests makes me feel so happy and supported. Children attending KU centres play and learn within a stimulating and encouraging environment, where creativity is celebrated. Each centre also has an area of special interest or focus, such as environmental sustainability, the arts, cultural connections, construction and many more. Now, if only workplaces would introduce employee chocolate appreciation as a special interest or focus, then we could all be happy. You can read all the books and websites in the world, but nothing compares to getting parenting advice in person, from an expert. The educators at my children’s childcare centre have offered me priceless advice, from reaching those milestones to improving social interaction. Their perspective is one that I value highly, as they know my children – and many other children – so well. Having a nurturing and supportive environment with qualified professionals sets my mind at ease when it comes to these key parenting moments. One of the main reasons why my children go to childcare (apart from allowing me to work – and more on that later), is so that they can make friends and learn how to socialise with others. When my daughter Emmy first started going to childcare, we didn’t know many other children her age. Now, she’s planning to invite her whole class to her fifth birthday party – and it’s not until October. It’s not just the children who make friends. I’ve become buddies with many of the mums, through meeting them at pick-up time or at birthday parties. I’m also really good friends with our centre’s director, particularly as she has excellent taste in music and fashion (Mariah Carey and Lacoste, in case you are wondering. Hi, Nikki!). My family and I love being part of this little community. Enrolling my children into childcare allowed my career dreams to come true. Back in 2014, I was starting out as a freelance writer. The work was there, but I lacked the time to actually do it. I decided that Emmy would attend childcare two days per week, and I would use that time to work. Shortly after I’d enrolled her, my editor asked me if I would be interested in working two days per week in the Mamamia office as a beauty editor. Because Emmy was in childcare, I was able to say yes to that amazing opportunity, and now I’m working as a writer and content creator for Mamamia and several other websites. As Emmy played and learned, I worked on an exciting variety of projects, such as articles on race relations, celebrity interviews and even a popular podcast about relationships. My 3.5 year old daughter also insisted on doing a photoshoot before bedtime. She styled me in her favourite Barbie Spy glasses (from a Happy Meal) and Hello Kitty hat. Girl knows a good accessory when she sees one! My local childcare centre is also cool with my irregular late morning drop-off times (“I’m an artist and don’t have a routine,” I tell them). I feel fulfilled and motivated in my career, which in turn helps me to be a happier mother. I want to be a role model for my children in so many ways. And I think it just might be working. What are some moments of joy you have experienced with your children? 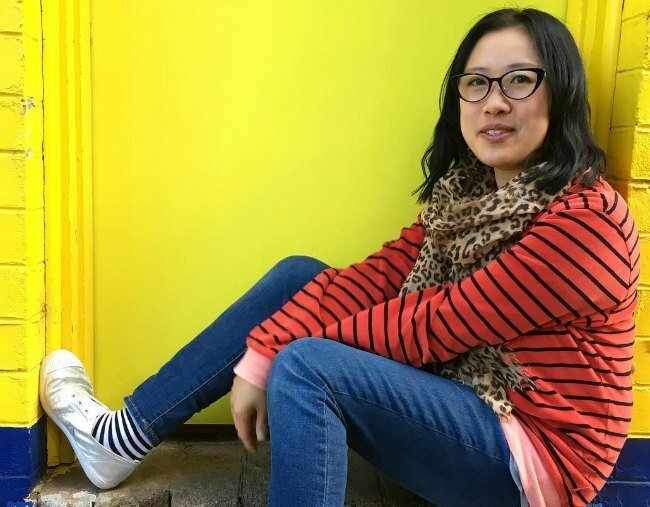 Carla Gee is a Canberra writer and content creator. You can find her on Instagram or under a pile of books, lipsticks and kids’ toys. KU Children’s Services offer a range of childcare services from preschool to long day care, before and after school care, vacation programs, family programs and more. For more information, visit ku.com.au. This content was created with thanks to our brand partner Ku Children’s Services.